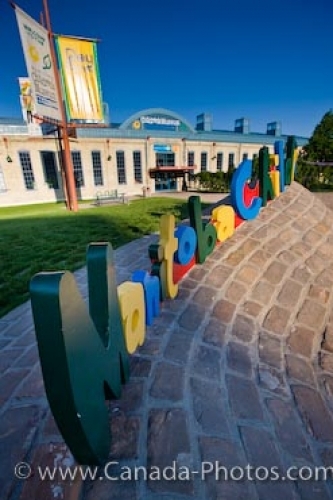 A colorful sign marks the entrance to the Manitoba Children's Museum at The Forks in the City of Winnipeg in Manitoba, Canada. A fun filled adventure for children and adults begins outside the Manitoba Children's Museum in the City of Winnipeg at the colorful sign. Each letter has been individually painted in colorful hues and built into the rolling mounds of brick. The museum opened its doors in 1986 with further additions being done in 1988 and 1994 but the location of the museum was eventually moved to The Forks. Once you enter the doors of the museum, children's eyes light up at the fascinating exhibits, some which are permanent and others which are continuously changing. Picture of the colorful sign outside the Manitoba Children's Museum in Winnipeg City.